West End resident M. Curt Sachs has proposed using the building on State Street as a homeless shelter, neighborhood health clinic, soup kitchen and transitional/affordable housing complex. 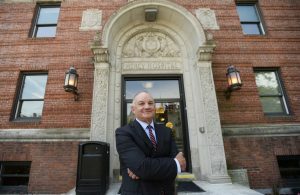 When Mercy Hospital announced this summer that it was on track to complete its move to the Fore River Parkway in three years, the hospital’s chief executive officer said officials would entertain a wide range of reuse proposals for its six-story building on State Street. “We want to see if there are some creative ideas,” CEO Charlie Therrien told the Press Herald. West End resident M. Curt Sachs was listening and he thinks he’s got just what the doctor ordered. 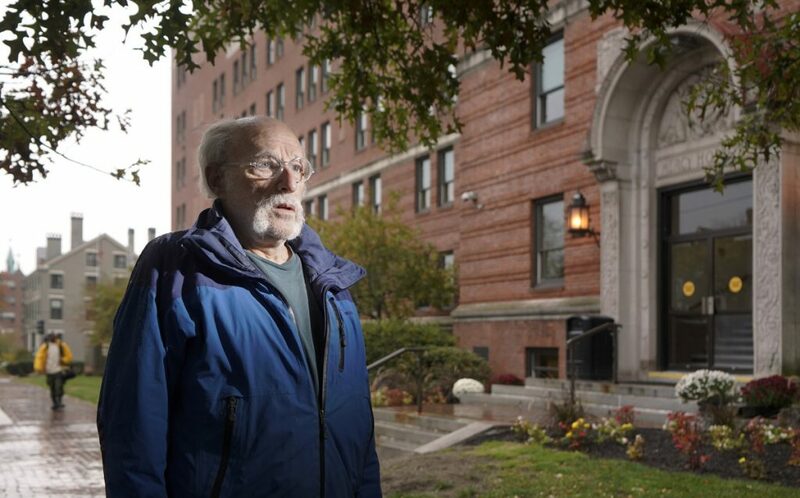 Sachs, a 69-year-old architect whose daughter has been homeless for the last decade, has submitted a proposal to reuse Mercy’s campus at 144 State St. as a homeless shelter, neighborhood health clinic, soup kitchen and transitional/affordable housing complex that would have on-site case management and counseling services, including detox beds for people struggling with substance use disorder. Sachs says the idea, which would rely on a partnership with the city, area hospitals and a consortium of social service providers, isn’t as farfetched as it might seem. He said the building already meets stringent building and fire codes. It’s structurally sound. Its medical facilities and commercial kitchen are fully equipped. And the upper floors could easily be turned into housing by removing a wall here and there and making some cosmetic upgrades. “It just started to jell and make perfect sense,” Sachs said of the plan he’s been working on for several months. Sachs is floating the plan as Portland is searching for a way to retire its aging, crowded Oxford Street homeless shelter in the Bayside neighborhood and transition to a modern facility where clients can get a variety of other services in addition to a bed for the night. Mercy Hospital CEO Charlie Therrien said in July that “We want to see if there are some creative ideas” for reusing Mercy’s building on State Street. 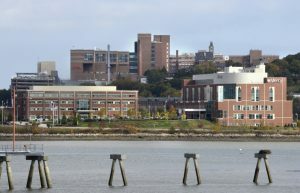 Mercy officials announced in July that the hospital would move forward with a long-planned expansion of its Fore River campus and move out of its State Street building by 2021. Officials said they’d use a community-centered process for selling the old building, which has been open for the last 75 years. After getting neighborhood input, they issued a request for qualifications and proposals on a national level and indicated a desire to maintain a clinical presence on site. Elizabeth Parsons, president of the West End Neighborhood Association, said she and the leaders of the Parkside Neighborhood Association and the Western Promenade Neighborhood Association have been meeting with hospital officials. The neighborhood association has asked that developers pay heed to the city’s new comprehensive plan and propose an idea that helps reconnect the fabric of the residential neighborhood, she said. Parsons said she is familiar with the Sachs proposal, but that the West End Neighborhood Association does not have a position on it. As an abutter, she is not personally opposed to it, as long as it’s properly resourced. Developers have until Nov. 1 to submit their proposals. Edward Gilman, communications director for Mercy, said 60 individuals from 30 different groups have toured the facility – a requirement before anyone can submit a proposal. Gilman said officials would not comment on any specific proposal. He expects the hospital to announce a finalist sometime in January. Sachs’ proposal comes as the city is trying to figure out a way to replace the Oxford Street Shelter, which has been in Bayside for the last 30 years. The Oxford Street Shelter is a converted three-story apartment building and auto body shop, where 154 people sleep on thin mats placed close together on the floor. Demand routinely exceeds capacity, so the city opens up one or more overflow shelters. And the city shelter lacks a soup kitchen and spaces to meet with people struggling with a myriad of issues, ranging from a lack of housing to substance use and mental health problems. Mercy Hospital plans to relocate and open a new facility in 2021 at its Fore River Parkway campus in Portland. The site now houses its urgent care center and medical offices. The staff proposed building a 200-bed facility at the city-owned Barron Center, but critics argued that the site on outer Brighton Avenue was too far from the services offered downtown. And residents in Nason’s Corner quickly organized against the plan, forcing city leaders to look at additional locations and different models, including building up to three smaller shelters throughout the city. The city’s proposal has generated a community-wide discussion about the future of homeless services in Maine’s largest city and some creative, albeit unsolicited, proposals. In addition to the Sachs proposal for Mercy, Kenneth Capron, founding director of the nonprofit MemoryWorks, offered a proposal that would use a decommissioned cruise ship as a homeless shelter, housing and service center for vulnerable populations, including the homeless, mentally ill and immigrants. Capron said he is seeking funding from the Robert Wood Johnson Foundation for a feasibility study. He’s already held one community meeting about the project at City Hall. Jennings said staff will present a new analysis of shelter options to the City Council’s Health and Human Services Committee on Nov. 13. He said it would be up to the council to decide if it would like to further explore any of those options, or one of the community suggestions. Mayor Ethan Strimling said he supports a mixed-use plan for Mercy Hospital, but still doesn’t think a 200-bed shelter model will work there or any other place in Portland. Although he supports scattering smaller shelters throughout the city, Strimling thinks ideas from Sachs and Capron should be considered by the council. Sachs does not have a cost estimate for his project, which would keep the shelter near to the downtown, but knows it would require some sort of public-private partnership to move forward. He hopes local service providers – such as Preble Street, Avesta Housing and the city, among others – will be able to work together on the site. Sachs said revenue for the operation could be generated through the community health clinic, which could be staffed with medical students, residents and attending physicians from area hospitals. Additional revenue could be generated by developing the hospital’s parking lot across the street, he said. This is something of a personal mission for Sachs, who began his career as a cancer therapist before becoming a licensed architect specializing in health care design. Sachs said his 28-year-old daughter has struggled with mental illness from an early age. Since the age of 18, she has been homeless and struggled with substance use. He said she spends her time on the streets of Brooklyn, when she’s not incarcerated. Sachs said he has volunteered one day a week at Preble Street’s soup kitchen for the last four years. 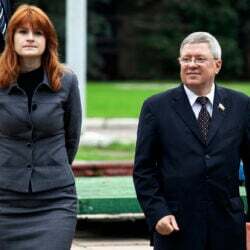 Helping people who may be in a similar situation as his daughter helps him cope, he said, noting that his late wife also volunteered before passing away earlier this year. Sachs said he threw himself into working on his homeless shelter proposal after his wife died in February. And he is constantly motivated by his daughter, whom he last spoke to last year when he picked her up after she served time for a felony drug charge.